At a Glance: Instantized formula mixes easily with a spoon Concentrated and unflavored for versatility Supports muscle building and recovery efforts Milligrams of total BCAAs: 5,000 2.5 grams of leucine; 1.25 grams of isoleucine; 1.25 grams of valine BCAAs, or branched chain amino acids, have long been used by strength-training and endurance athletes alike to activate muscle synthesis and reduce muscle breakdown caused by intense training. Optimum Nutrition’s Instantized BCAA 5000 Powder is made using a proprietary process that mixes easily and keeps the BCAAs suspended longer so they do not readily settle to the bottom of the glass. If you can’t drink your BCAAs, they can’t help your performance. 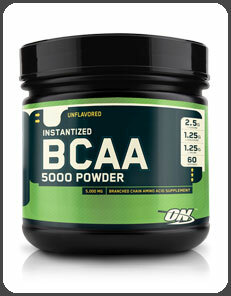 Optimum Nutrition Instantized BCAA 5000 Powder, Unflavored, 336 grams.